The conviction of the British nineteenth century Prime Minister and writer, Benjamin Disraeli, that "as a general rule the most successful man in life is the man who has the best information" still holds true today. It is especially true for modern Manufacturing Companies, where an integrated and consistent flow of information determines the efficiency and success of strategy and endeavor. zenon offers users a multitude of tools and technologies to create a transparent platform of information. 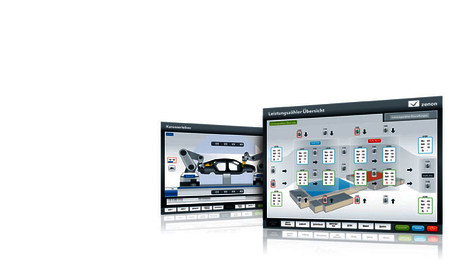 Using zenon, automobile manufacturers can create decisive advantages, whether configuring the application, implementing the solution, or in subsequent service and maintenance. zenon users only need to create a project once. It is then available on all platforms – from Windows CE through Windows XP, Vista or Windows 7 to Windows Server platforms. Clear structures are possible in zenon thanks to zenon’s project hierarchy and multiple project administration functions. All data is available centrally: projects can be maintained easily. Data, screens and functions can be consistently reused, both within and across projects. With zenon’s sophisticated network functionality, complex network designs can be created very efficiently in a short amount of time. The integrated topology graphically displays the interrelationships of individual projects with their respective servers and provides the necessary overview.